We apologize for the unavoidable inconvenience this creates. april 17, 2000. For an update to this article, see Cybervoices: Healing old wounds, October 8, 2001. 100 percent of them contradict the new image of San Francisco articulated by computer programmer Kevin Kokoszka: "You look around, and everybody is making money, driving a Range Rover or a Lexus…. It’s like a Gold Rush right now." For those of us who live here, the existence of a grungy undercoating to the shiny refashioned city by the bay is no surprise. 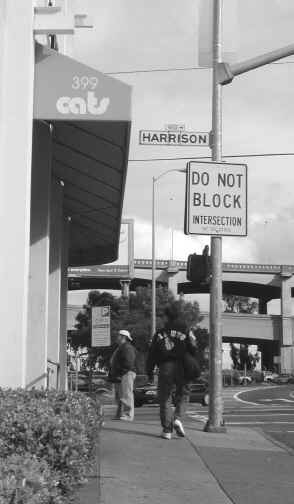 Although homeless people stimulate a variety of responses, nevertheless they form a familiar part of our daily landscape. But for tourists, their presence must come as a shock. And according to the hype accompanying Earl Rynerson’s failed Proposition E, they’re an embarrassment to entrepreneurs trying to develop new business connections. For the busy bureaucrats in the Department of Human Services, however, San Francisco’s homeless population must be a constant source of frustration. These people are an uppity lot. They won’t grovel, Dickens-style, grateful for whatever crumbs the city throws their way. They won’t go away. They just stick around as though they belong here. The Human Servers are caught in the middle. On the one side, members of the growing homeless population press their noses against the window, asking for a warm space by the fire in which to spend the night. The Servers know the present system isn’t working. 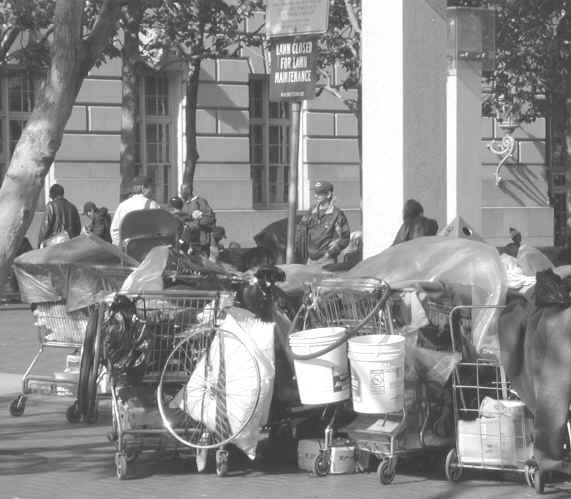 An accessible shelter report prepared last August by the Local Homeless Coordinating Board acknowledged that "the shelter system in San Francisco is largely set up to insure the survival of the fittest." But in any case, the report added, "emergency shelter is, by definition, not the ultimate answer to homelessness." On the other side, the higher-ups in the mayor’s office and at the state and national level have made it clear that more funding is not going to miraculously appear. And prices in this city continue to climb, so that funds already in hand do not go so far as they used to. In short, we’re in the midst of a crisis. And deeply engrained habits of paternalism and secrecy are making it worse. The coalition’s revelations led to a confrontation at last Monday’s meeting of the Local Homeless Coordinating Board that would have been comic if it had not been so disturbing. DHS director Will Lightbourne presented a report "for discussion only" of his department’s redesign plan, which he insisted was not a plan but rather "a point to start dialogues." Unfortunately, many members of the audience had seen copies of the coalition’s requested information, which graphically laid out a draft timetable, complete with lists of tasks along with their start and finish dates. Equally unfortunately, many members of the Local Board had not. Will Maggie Donahue [director of DHS’s housing and homeless programs] be leading the process? Is DHS leading it, or some other body? Lightbourne: DHS will lead, with dialogue with the service providers. How do you fit this plan with the continuum of care [the city’s basic mode of providing service, which the Local Board is now extensively revising]? Lightbourne: We’ll have to see. We’ll have to see. What we can see now is a topsy-turvy process that rivals Alice’s experience behind the looking glass. DHS has put together a Not-a-Plan that is now ready for discussion by service providers and members of the homeless population, the people who will run and receive it. The more odious provisions of the Not-a-Plan resemble the ill-fated Proposition E: its collection of payment for services; its transfer of referral procedures from a variety of service providers to a centralized agency; its linking of services to compliance with regulations. But there’s a puzzlement here. Work on the Not-a-Plan began long before Prop. E appeared on the March ballot. Was it cobbled together in preparation, just in case? If so, why is it still in the works, when the people of San Francisco have said they didn’t want it? The Not-a-Plan is a slap in the face — to the voters, to the Local Homeless Coordinating Board and its affiliated organizations, to the people it professes to serve. In the name of integrated services, it offers a more rigid bureaucratic system. Faced with arterial bleeding, it applies yet another band-aid. Meanwhile, the crisis intensifies as the housing market tightens. Existing shelters are already bursting at their seams. Affordable housing is disappearing. During the past year, city employees from DHS, the mayor’s office, and the Department of Public Health have conducted hundreds of community meetings, drawing on the practical experience of thousands of service providers and homeless people, seeking new approaches to an old problem. And all the while, the preparation of the Not-a-Plan was making their brainstorming irrelevant. The Not-a-Plan is not acceptable.